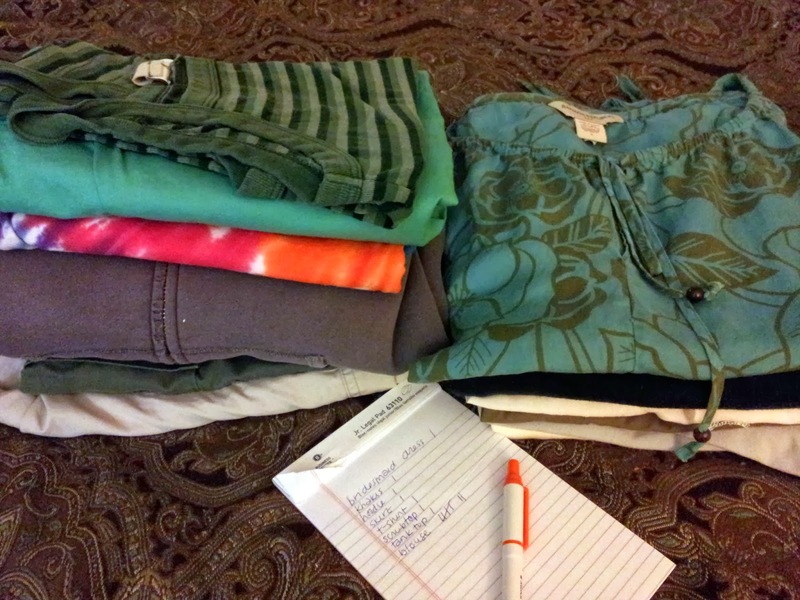 At least twice a year I sort clothes, make a list, bag them up, and drive them to the closest donation center. In between trips I pile clothes-to-donate on the bed in the smaller spare room. When I wear something that is uncomfortable and annoys me all day, it goes directly into the pile (after laundering, of course). This weekend I put together another load (one of my October goals, by the way). The picture below shows the start of the pile and list. In addition to the clothes, I also donated two pairs of sneakers and a bridesmaid dress from 8+ years ago. I went through my closets (yes, plural) and my dresser drawers and was dismayed at how few items I was willing to part with. I have SO many clothes. I read somewhere that when you purge clothes you should only keep items you really LOVE. If I did that, I would be left with four t-shirts and nothing else. Even my usual process of setting aside items that are uncomfortable fails me on a regular basis. Today, for example, I wore a red zip-front sweater from Eddie Bauer that was a Christmas gift from my step-mom. I dislike sweaters of all varieties and I can't stand anything with a collar (or neck of any style), but I can't bring myself to donate the sweater since it was a gift and is not that old (relatively speaking). And yet, it makes me unhappy EVERY time I wear it. What is this all about? How can I learn to detach myself emotionally from pieces of clothing? I don't actually want to own this much stuff! I saw a good tip that might help you! Hang all your clothes up and turn the hangers backwards. When you wear something turn the hanger around. Then after a few months you can see what you really don't wear and get ride of it! That is a great idea, Rachel! Thanks! K read yr story about great Bear and then read this. Having trouble with iPad, sorry. It was his choice, he picked it from the list. If you wear something yr not fond of and someone compliments it--give it to them. If I ever give you something you don't want, heave it out or pass it on to someone else.